Central Oregon is the epicenter of western junipers, Juniperus occidentalis. In parts of central Oregon, western junipers extend for many miles/kilometers and are the only type of tree that grows there. The tree is barely present in Washington and absent in British Columbia. 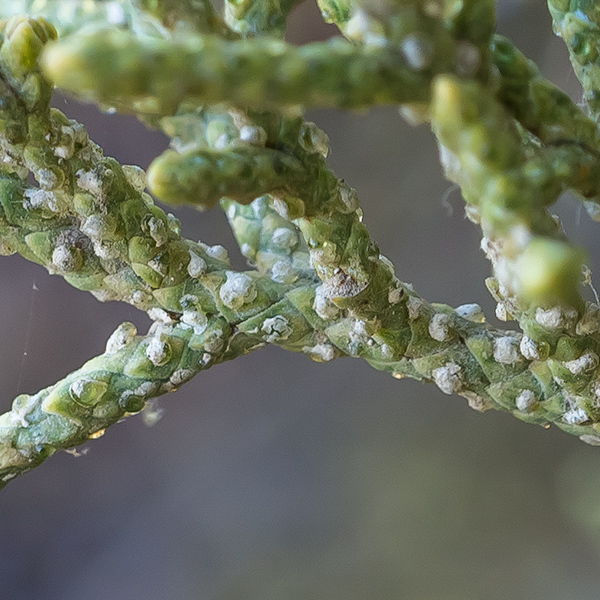 Apart from location, a telltale sign for distinguishing these species is barnacle-like glands that are abundant on the scales of western juniper. On Rocky Mountain juniper and seaside juniper, glands like this are either absent or inconspicuous. All junipers are conifers, meaning that the seeds grow in cones. But juniper cones bear little resemblance to pine cones. Instead, they look more like small blueberries. These cones are called "juniper berries" and contain usually 1 to 3 seeds each. Gin is made from juniper berries (plus neutral agricultural alcohol). Recently, distilleries have sprung up in central Oregon that produce gin from locally picked juniper berries. I can vouch that central Oregon gin is tasty, either straight or in cocktails. Older PostIn the fall, why are alder leaves on the forest floor still green?